(E No. 5) Reconnaissance of Port Royal Entrance and Beaufort Harbor South Carolina. An uncommon U.S. Coast Survey nautical chart or maritime map of the entrance to Port Royal and Beaufort Harbor, South Carolina. The map covers from the city of Beaufort, top center, along the Beaufort River, to the Broad River and eventually to the Atlantic. Includes St. Michael's Head, St. Philips Island, Coles Care, and Joiners Bank along with South Breakers, Martins Industry, Gaskin Banks, and other undersea dangers. Countless depth soundings throughout. Sailing instructions located in lower left quadrant. 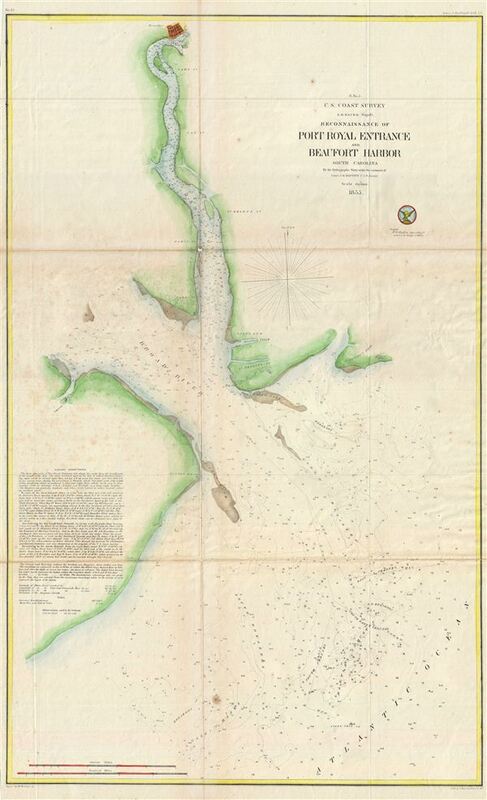 The hydrography for this map was completed by J. N. Maffit and the whole was compiled under the supervision of A. D. Bache, one of the most influential Superintendents in the history of the Coast Survey. engraved by Julius Bien and published in the 1855 edition of the Superintendent's Report. Bache, A. D., Report of the Superintendent of the United States Coast Survey, Washington, 1855. Good. Map exhibits typical wear, verso reinforcement, repair, and toning along original fold lines. Blank on verso.